The sight of seven majestic voyaging canoes (vaka) in Hilo Bay last weekend was awe-inspiring. 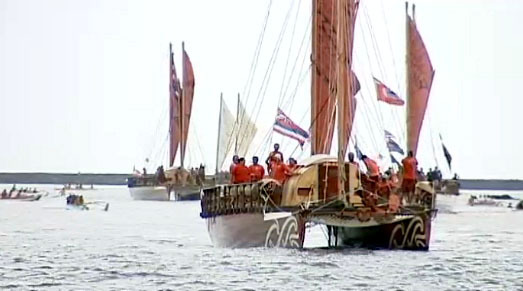 The vaka from Aotearoa (New Zealand), Tahiti, Cook Islands, Fiji and Samoa, along with two “Pan-Pacific” vaka with crew from other Pacific islands, crossed the ocean to share their experiences and ancestral knowledge and renew bonds with the sea and with ancient traditions. The voyage also has a mission to bring awareness of the alarming changes in the Pacific that endanger the health of our ocean and the resources it provides to millions of people who depend on it. By this weekend, the voyagers will have reached O`ahu. While there, they will participate in a conference that seeks to address the impact of stresses, such as climate change, overfishing and pollution. Some of the effects of climate change on the marine environment are easily observed and understood, for example, the warming of sea waters and the rising of sea level as more and more glacial ice melts. Another effect related to climate change is more subtle, but has devastating consequences for marine life: ocean acidification. Ocean acidification refers to the lowered pH of the oceans due to the reaction of carbon dioxide (CO2) with seawater to form carbonic acid. CO2 is the most prevalent greenhouse gas in the Earth’s atmosphere. Since the beginning of the industrial revolution about 200 years ago, the oceans have absorbed 525 billion tons of CO2 from the atmosphere, nearly half of the fossil fuel carbon emissions over this period. This natural process of absorption has benefited us by reducing the greenhouse gas levels in the atmosphere, thus minimizing some impacts of global warming. The ocean’s daily uptake of 22 million tons of carbon dioxide, however, is taking a toll on the chemistry of seawater. The drop in seawater pH wreaks havoc on the chemical equilibrium of calcium carbonate, a mineral used by marine organisms like corals, lobsters, and crabs to build shells and skeletons. As the oceans become more acidic, these organisms will grow more slowly, and corals may be unable to build reefs fast enough to keep up with the rising sea level. The impacts will propagate throughout the marine food chain, affecting species diversity, commercial fisheries, and tourist economies. 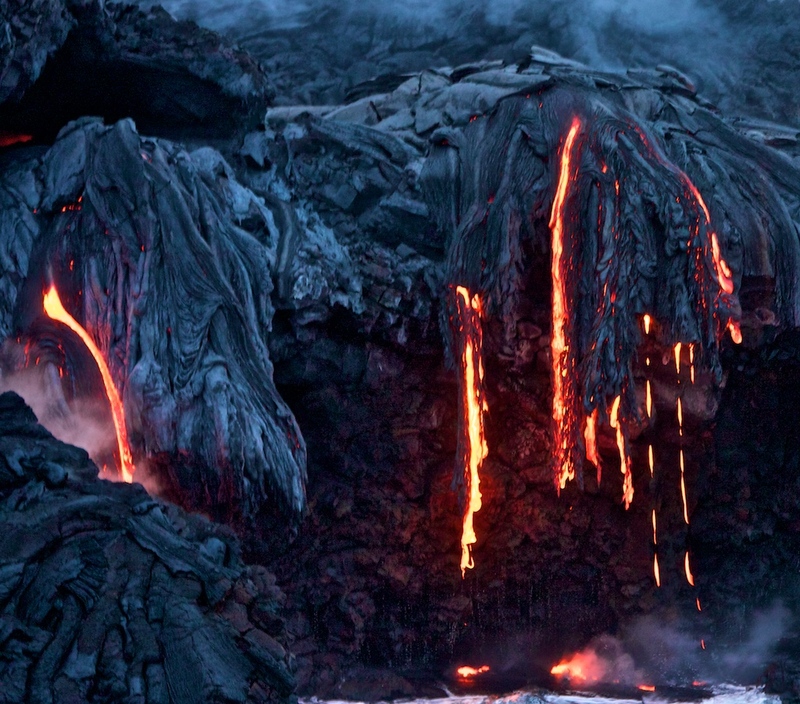 There are still some skeptics who remain unconvinced that human activities are the major contributors to global climate change, and they often direct the blame at volcanoes. There is no doubt that volcanic eruptions add CO2 to the atmosphere, but compared to the quantity produced by human activities, their impact is almost trivial: CO2 output of the Earth’s degassing subaerial and submarine volcanoes is about 150-260 million tonnes per year, whereas human activities contribute more than 100 times that quantity (about 35,000 million tonnes in 2010). Every 2.7 days, human activities emit an amount of CO2 comparable to the annual global volcanic CO2 emissions. During the ongoing Kilauea eruption, the average annual CO2 emission rate is about three million tonnes. Even the Mount Pinatubo eruption on 15 June 1991—one of the three largest eruptions of the twentieth century—released only about 50 million tonnes of CO2, or about 6 million tonnes per hour. The human CO2 emission rate of 4 million tonnes per hour is similar. So, for a few hours during large eruptions, individual volcanoes may emit about as much or more CO2 than human activities. But volcanic paroxysms are infrequent, while anthropogenic CO2 is emitted continuously. The U.S. is the single largest contributor to global warming, responsible for nearly one-quarter of global human emissions. The more CO2 in the air, the better, up to (and probably well beyond) 2,000 ppm. Plants love it, and we depend utterly on them. Use coal to make cement from limestone, release the clathrates, and thaw the permafrost; we’ll need it all.